Can Safer Chemicals be More Profitable? Chemical safety is a topic never far from public perception. While plastic waste is currently the biggest evil in the headlines of newspapers and social media, a newly published report highlighting the increasing concern of the scientific community over chemical mixtures is likely to bring public attention, once again, to the risks of chemical exposure. The study is a collaboration between Andreas Kortenkamp from Brunel University in the UK and Michael Faust of Faust & Backhaus Environmental Consulting, and focuses on opinion among research chemists and chemical legislators. As understanding grows of how a cocktail of chemicals can cause greater damage than the sum of their parts, regulators are beginning to consider further restrictions on the chemical industry. While this may be a source of major concern for many chemical manufacturers, there is a wave of thinking that suggests that chemical safety doesn’t have to be expensive or even an added cost. Instead, innovation can make chemical safety profitable. Innovation can make Chemical Safety Profitable. Much of this theory is based on the idea of chemical substitution; finding innovative ways to replace toxic chemicals for safer ones. However, to do this, it is important to understand how chemical products will be mixed, used, and even disposed of. This is an idea that has been taken up by the European Chemical Agency, and was outlined in January in a report called, the ‘ECHA’s Substitution Strategy’. The report emphasises the importance of communication for all actors along the chemical industry supply chain. For example, that chemical raw material suppliers need to inform chemical processors of their sources, chemical end users need to inform manufacturers of their product uses, chemical producers must explain their ingredients, and so on. To Support Informed and Meaningful Substitution of Chemicals of Concern. Vainio is due to discuss the ECHA vision of greater communication and substitution at CIEX 2018 being held in Frankfurt on September 19th and 20th. 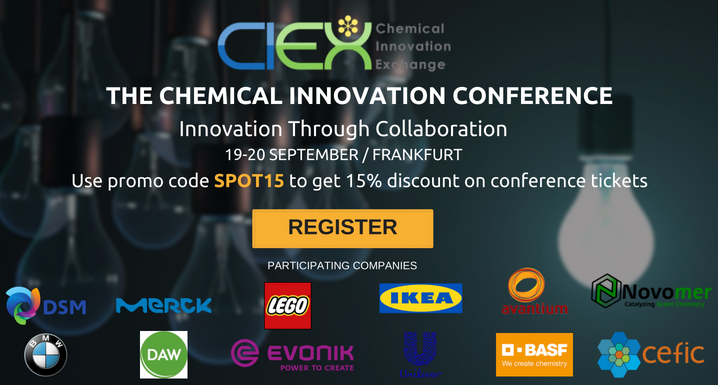 The event has been created for R&D and innovation experts from the consumer, industrial and specialty chemical sectors, and is a unique platform for participants to learn, exchange ideas, and collaborate. Legislators are influenced by public opinion, so it is vital that the chemical industry remains proactive in prioritising safety. The public will always be worried about toxic chemical exposure, be it through poisonous nerve agent attacks, BPA risks, or the dangers of household cleaning products. But if the scientific community is also starting to have concerns, then it is necessary for the chemical industry to react accordingly. Not defensively, with fear over the increased costs that restrictive legislation may bring, but with the understanding that the correct chemical product strategy can create a ‘win-win’ situation. Can safer chemicals be profitable? With innovation and cooperation, then the answer is ‘Yes’. Photo credit: MSDSOnline, OHSA, ECHA, ShareIcon, CommonsWikimedia, Iconsdb, SmileySymbol, emoji, vivilaparrochia, & Science.